Dallas Vintage Shop has Historical Ministers Attire for Famous Religious Clergymen Costumes like this Edward Winslow, Puritan Minister from Plymouth Colony Outfit shown here. Whatever the Religion or Denomination, chances are that our Dallas Area Costume Shop has the Clerical Garb, Religious Holiday Traditional Priest, Famous Saint, Religious Martyr or Bible Prophet, Preacher or High Priest Costumes or Period Correct Clothing or Liturgical Garb you need. 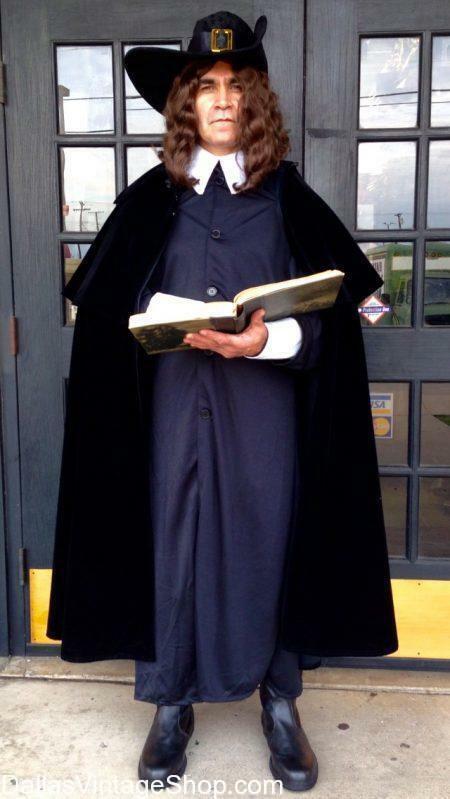 Our Dallas Shop has all the Ministerial or Historical Clergy Costumes and Accessories you need. Get Clerical Costumes for Theatrical Religious Productions, Christian Holiday Ministers Traditional Garb, Jewish Old Testament High Priest Robes & Costumes and Famous Historical Saints Period Attire. All of the Catholic Priest Liturgical Costumes, Catholic Popes, Iconic Saints, Famous Bishops, Religious Denomination Founders, The Crusades Period or Protestant Reformation Preachers Costumes and all the Historical Ministers Attire you need, along with all the Clergyman Costume Accessories you could possibly need are here at Dallas Vintage Shop. We even have the Historical Wigs, Facial Hair, Makeup and Special Effects Prosthetic items you might need to do a character of your favorite Historical Clergyman.